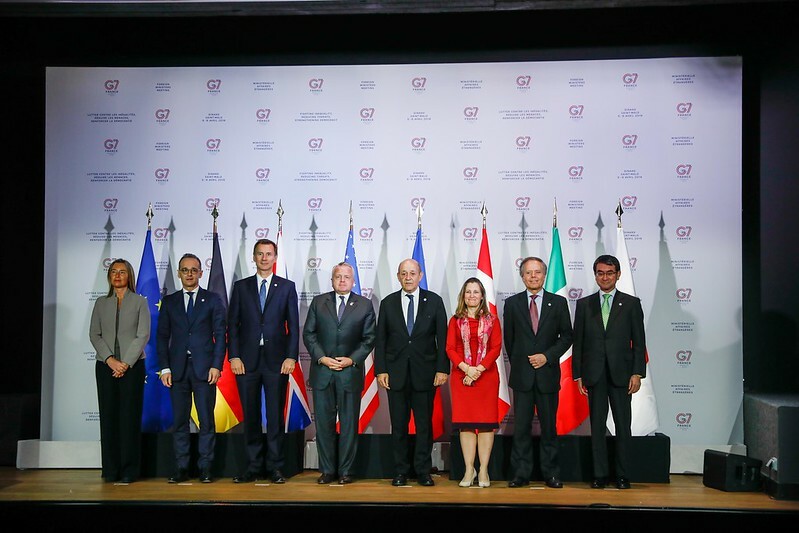 Minister for Europe and Foreign Affairs Jean-Yves Le Drian will meet with the other G7 foreign ministers in Dinard and Saint Malo on 5 and 6 April 2019.
strengthening our democracies in the face of new threats, mainly arising from the digital revolution and attempted foreign interference. The commitments made in the Paris Call for Trust and Security in Cyberspace of November 2018 will be discussed. A specific session will be devoted to Africa, a priority of France’s G7, where the ministers will discuss the international community’s action to support African peace operations and to fight trafficking in the Sahel region. Reducing gender inequality will be a focus of discussions on such topics as protecting women from sexual violence in conflicts and strengthening the role of women in peace processes and crisis resolution. International organizations will be fully involved in the ministers’ discussions on Africa. Other participants include Moussa Faki, Chairperson of the African Union, and Leïla Zerrougui, Special Representative of the United Nations Secretary-General and Head of the United Nations Stabilization Mission in the Democratic Republic of the Congo. Phumzile Mlambo-Ngcuka, Executive Director of UN Women, and Vanessa Moungar, Director for Women, Gender and Civil Society at the African Development Bank – both members of the G7 Gender Equality Advisory Council – will also attend the meeting. Ahead of the Biarritz Summit to be held from 24 to 26 August, the foreign ministers will come up with proposals for fighting inequality, reducing threats and strengthening democracy.